To: Errantiate (i.e. 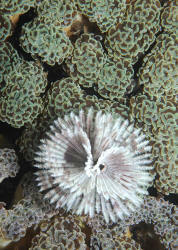 Non-tubiculous) Polychaetes (many known to hobbyists as "Bristleworms"
Sabellastarte indica (now S. spectabilis) (Savigny 1818), the Magnificent Banded Fanworm. Cosmopolitan; all tropical seas. To four inches in diameter (coronal head). 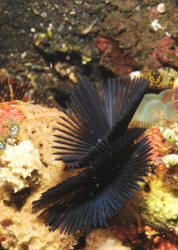 The most common "Feather Duster Worm" sold in the pet trade. These two off of Gili Air, Lombok, Indonesia. Sabellastarte sanctijosephi (Gravier 1906). Indo-Pacific; Eastern Africa to the Hawaiian and Cook Islands. Image shot off of Hawai'i. Characterized by their two tentacular crown head.